One of the trailers I saw, when I was last at the movies, was the one announcing the December 2018 release of Mary Poppins Returns, the sequel to the movie I loved so much when I first saw it in 1964. 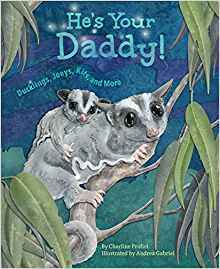 If you are thinking you would like to see it, and perhaps even watch the original with your children before you go, this new picture book is the perfect introduction. It is an adaptation of the original 1934 novel by P. L. Travers. Of needs, it does not include every character or event. It does do a commendable job of assuring young readers a look at the beloved main characters, and some of the fun Jane and Michael enjoyed under Mary's tutelage. Mary comes to Number Seventeen Cherry Tree Lane when the children's nanny makes an unexpected departure. It's bedtime and the children can see and hear the wind blowing wildly outside, when they see a strange shape headed toward them. 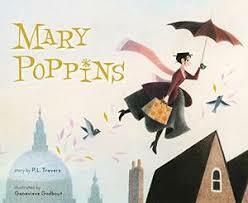 It's Mary Poppins, and she has arrived because of that wind. The children are delighted by her presence, and her no-nonsense care. Immediately they realize they want her to stay. "I'll stay till the wind changes," she said." That night is just the beginning of many adventures. They meet the Match-Man and admire his work, visit with Mary's uncle, Mr. Wigg, and eat gingerbread with Mrs. Corry and her daughters. They even watch Mrs. Corry, Annie and Fannie paint the sky with glue so Mary can stick their gilt stars up there. Oh, their lives are filled with special days and nights. And then, one day, the wind changes. Ms. Godbout uses soft pastels and colored pencils to fill the book's pages with lovely charm. Readers will very much like paying attention to the expressive and detailed scenes as they listen to this carefully told story. Do you have any potato pants? You will need a lot of energy to share this book with little ones, and a willingness to read it repeatedly. It is exactly the kind of story that makes them laugh and beg to hear it again. It is pretty silly, and that is what makes it such fun as a readaloud. It begins with Potato doing the Robot. The reason? He is very excited about a 'one day only' potato pants sale at Lance Vance's Fancy Pants Store. Say that five times as quickly as you can. The language is lively, filled with emotion, and much appreciated humor. "WHAT'S THIS? POTATO IS UPSET! You can hear that wordplay, can't you? 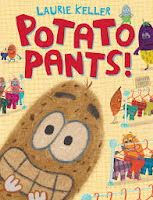 The two have clashed previously, and Potato is determined he will not be outdone by the eggplant in his quest for a pair of potato pants. Still, he does not want to be in the store at the same time as the eggplant. He bides his time, until he can't stand it any longer. What happens next will surprise readers and result in a solution to their dilemma. The artwork is as much fun as the text is. Kids will patiently give the time it takes to ensure they don't miss a single detail on the action-filled pages. If you were a hatchling ... "
As I have often said: kids love books about animals that teach them something new. Here, they will add to their repertoire of understanding the natural world by learning the infant term given to a dozen young animals whose names are not the same as their daddy's name. Most of the animals presented will be familiar. The repetitive rhythmic text is accompanied by lovely mixed-media artwork that places each pair in familiar surroundings and natural settings. The double- page spreads help readers familiarize themselves with the terms used to describe the baby/daddy match. That pair of names is shown in boldface, italic print, helping keep attention on the new words to be learned. There is a twist at the center of the book that reveals a surprise - much appreciated by many, I am sure. The final spread of the text will please all dads! Following that the book is enriched by the addition of very useful backmatter. A matching game with an answer key, and thumbnail photographs of each animal presented and accompanied by a short paragraph of additional information are meant to help children explore even more. night. Sweet sap is one of their favorite foods. before leaving its mother's pouch." Following that, suggestions are made for parents and teachers on furthering the learning: how daddies help care for their babies, a chart of other daddies whose babies share the same names, tips for reading aloud, and the science and math connections that might be made while sharing this book. There is even a website code to be scanned that will lead to useful online resources for this book and others from Dawn Publications. around, the sloth was perplexed. home would be pretty laid-back. fast they left their stripes ... "
Poor Sloth! Caught up in the rush that is life because of a delivery mistake! A careful look at the endpapers is all that is needed to help readers discover exactly what has happened to Sloth. The Zoom is similar to the Zzzzzoo; it is not the same thing. In fact, for a leisure-loving sloth, her new home is entirely inappropriate. Little ones will catch on quickly. All of the animals she meets are in constant and humorous motion - from the monkeys who move so quickly they climb above the tops of their trees, to the parrots whose colorful tails draw rainbows as they whiz past. Once settled in, the sloth makes it her mission to find a friend. No animal is interested in slowing down at all. Each has too much to do, and it must be done in a hurry. If you know anything about the sloth, you will know that speed is not the name of her game. "The sloth shrugged her shaggy shoulders. Sounds perfect to me! But, the sloth is lonely and remains vigilant in looking for a friend. My mother used to tell me that 'all things come to those who wait.' Turns out she was right - again! The sloth finds a friend who is exactly right for her. Can you guess who that might be? I can tell you that the new friendship has an impact on all those who live at the Zoom. Ms. Becker's rich language and storytelling makes this an excellent choice for a shared read. The appealing, and often humorous, artwork keeps kids' attention focused on the animals and the action. 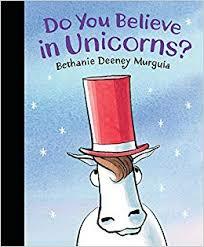 You know how much little ones like books about animals - especially if they have a question and answer component that makes those kids part of the reading experience. They are consistently pose questions about an infinite variety of things they want to know. Etta Kaner has experience with the kinds of questions kids ask. 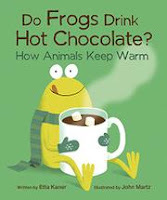 In her new book, she wonders for them 'how animals keep warm.' 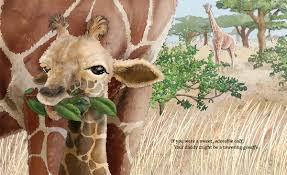 Adaptation is a fascinating subject when we consider exactly how animals change to suit their environment and climate. The ones featured here are found throughout the world. Some will be familiar, others will not. The information is appropriate for a young child, and will add to their knowledge base while also encouraging them to look further concerning those animals that are unfamiliar. Digital illustrations add humor and context. Japanese Macaques love to take warm baths! will jump into these hot pools to warm up." I think we can all use inspiration for kindness every day in every way. So, the people at Pajama Press have created this book to inspire kindness when talking with children. Royalties from the proceeds with be donated to Think Kindness, an organization you can find through a Google search. There are ideas there for school children from early years to high school, and some global suggestions as well. Gail Winskill, Publisher at PP, asked her editors and illustrators to take part in this project which came about through an experience with her granddaughter. Alice had just started school and been treated unkindly. Her mom suggested that she do her best to be kind always. When asked 'how', Gail knew a book would help ... as so often happens. 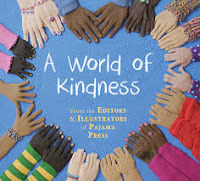 The questions are asked of young readers, and the illustrations inspire quiet conversation about the many ways we can show kindness to others. Nine artists are included, in artwork already published or pieces specifically created for this book. They show young readers some of the many ways they can be kind and helpful. A table of contents provides the illustrator's name, and whether the art is original, or the title of the book where it can be found. The endpapers encourage compassion, patience, sympathy, understanding, friendliness, honesty, gentleness, tact, empathy, consideration, care, generosity, tolerance, graciousness, helpfulness, and thoughtfulness - each and every one a worthy pursuit. Empathy and kindness can be severely lacking in these divisive times, and we can often look to children to show us the way. What??? The rest of the two page spread that describes Hong Kong is filled with colorful, iconic scenes and captioned with absorbing tidbits of information that describe the city, its markets, foods, and signs. I found myself checking out every scene. The world's longest permanent light and sound show. It goes on. Fascinating, to be sure. leave you with more questions than answers." The front endpapers show a world map with all stops plotted on it. A dotted line leads from beginning to end of the tour. Endpapers at the back show a darkened world, illuminated by dots of light, and the promise that 'there's still so much to explore!" I wonder if we might see a companion book in the future. Done with watercolor, gouache, pencil and digital collage, the author creates artwork that captures the spirit of each place. There is great variety in the destinations chosen, and much to discover as the book is explored. What a way to travel the world from the comfort of home! Enjoy every minute spent poring over it with interested readers. "Wednesday wondered about it all day long, and all night, too. What did the sea have that her fishbowl didn't have? She scarcely touched her food. She no longer leaped. Could Piper have been wrong?" 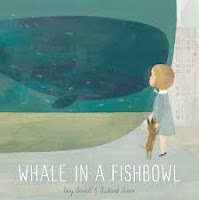 Readers will be drawn to Wednesday's plight: a whale living in a fishbowl in the center of an urban landscape. Life has always been the same for her. Passersby are too often unaware of her presence as they bustle about their day. One day she leaps upward and sees a blue she has never seen in her life. It is beyond the city that is her home, and she feels an affinity toward it. She does not know why. She does, however, feel its power and begins breaching more and more often in an effort to keep it in her sights. The people passing by think she is performing tricks for their entertainment. One small child, Piper, is more astute. She knows that Wednesday does not belong where she is, and she tells the whale just exactly that when she visits with her one day. She swam and swam and swam. She swam strong and far and deep." Beautifully written and illustrated, this is a story for children to love and to listen to again and again. "Grandpa's tales all began at his Magic Story Chest. This was a great big wooden trunk hidden in the darkest, most cobwebby corner of the attic. Each time he told me a story, Grandpa would blow the dust off the old chest, open the heavy lid with a bone-rattling creak and reach in for something special he had picked up ... "
Charlie and his grandfather love to spend time together. Charlie, because he is in awe of his Grandpa's stories and imagination; Grandpa, because he allows his imagination full rein, and is thrilled to share his tales with his beloved grandchild. It's a win-win time for both. Babysitting is filled with adventure for the two. Grandpa is quite the entertainer. Charlie loves his magic, he is even more intrigued by the tales that begin in the 'Magic Story Chest.' Each tale told is sparked by a personal memento Grandpa has brought back from his travels: an hourglass from King Tut's tomb, a long, white scarf that once belonged to the Red Baron, a coconut shell from a tropical beach. As Grandpa tells his stories, Charlie is enthralled with his many adventures. While Charlie lives vicariously through those stories he hears day after day, his father is not impressed. "They're just tall tales, Charlie," he said. "Things Grandpa's made up. He's never been to Egypt or flown a warplane or been chased by a dinosaur. He just imagines all those things." Of course, Charlie doesn't believe what his father is telling him. He goes to his grandfather who shares his wish that grown-ups would never give up on imagination. "The imagination is the most powerful force in the world. Magic is all around us, kiddo - in me and in you. All you need to do is believe. You know what I like to say? Whatever you believe, you can achieve!" Then, he gives Charlie a very special gift. 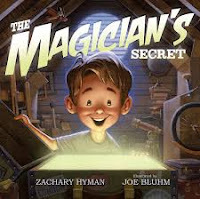 Zachary Hyman listened to his grandfather's tales of triumph and imagination as a youngster, and his Grandpa's assertion that to be able to see something, you had to believe it. Today, Zach plays in the NHL. Joe Bluhm also listened to his grandfather tell stories about building houses in wartime. He loved listening even though they saw each other rarely. He used those memories of their visits to help him create the light-filled, expressive , and detailed digital artwork that accompanies Zach's most enjoyable text. ""Pepper's name reflects its peppy, likable personality. It's also easy to say in many languages. That's important because Pepper is expected to operate in countries all over the world. In Japan, Pepper is already being used as a retail clerk in some stores. And it may soon be employed there as a sympathetic caregiver or companion to people who need extra help with day-to-day tasks at home." 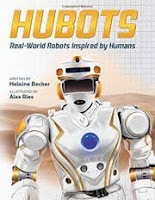 Pepper is a 'hubot', already produced and being used; other robots modeled on the human body are described in this follow-up book to Zoobots (2014). I am thankful that 'roboticists', and capable, inquisitive researchers such as Helaine Becker can tell these stories that are so fascinating, and so beyond my reasoning. I can hardly fathom it while I am reading all about them. "Imagine a future in which human-like machines live among us. These robotic "people" would walk, talk, and think. They might sit beside you in the classroom, serve you lunch in the cafeteria or drive the school bus that takes you home each day. Amazing - and true." is then categorized according to name, team, domain, and realm. Then, in short informative notes, readers are made aware of its mission, superpower, special ops, specifications, applications, and status update. The format is clear and accessible. Kids who have a passion for learning about robots and their future uses have much to digest. Each one is modeled on the human body, and most are being built to help in the event of emergency or to work in industry. A section at the center of the book describes the 'uncanny valley' - the low point of a graph that tracks human response to the way robots look as they change over time. Following the description of each of the 'bots', the author presents notes that offer a closer look at the hands, feet, vision being developed. She reminds her readers that these hubots are the current crop; the future holds promise that they will become even more lifelike and find their own place in our world. A glossary and an index follow. Alex Ries does a great job, using Photoshop, of providing a realistic view of the way these hubots might eventually look. It is a book that begs the question: how do you feel about robots taking over some of the jobs humans now do? 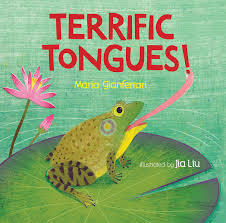 The format for this book that introduces its audience to twelve tongues belonging to a variety of creatures will appeal while also providing new learning. Readers are invited to guess what owns the tongue being described. As you know, young readers love being involved in solving mysteries, and shouting out their ideas. 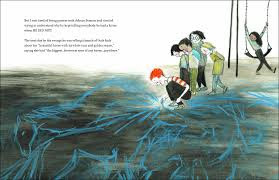 The book also acts as a perfect mentor text for children who want to share research data about something they are studying. The format is consistent throughout, and results in an effective and satisfying read. Each turn of the page discloses the animal whose tongue has been described. I was fascinated to learn much about tongues that I did not know. Children are sure to feel the same, even if it is a creature they find familiar. cooling the rest of the body." This accessible and instructive text following the reveal is useful and appreciated. The creatures are varied, and backmatter adds to the learning from the main text of the book. Additionally in backmatter, there is a final section called EVEN MORE FUN TONGUES! Here readers will find a select group of creatures and a short description of what is special about their tongues and what they use them to do. Jacobson's organs to smell and detect prey from miles away." Now, where will a reader find a book about komodo dragons? Is it a horse? Hard to tell, isn't it? It has all the characteristics of a horse when you see it on the cover. Open the book past the purple, horseshoe-patterned endpapers and you can see it's even housed in a horse's stable. It certainly looks like a horse in a hat. A monkey wrench is thrown in when the author questions if it might actually be a unicorn? The argument goes in favor of it being a horse with messy hair, who likes the color red, and who needs protection from the sun. Other horses begin to appear on the book's pages, and the conjecture continues. Aren't unicorns hard to find? What is the reader to think? When the three hats worn by the horses are seen lying beside the river where some splashing is happening, the mystery may be solved. Not quite so fast! As the horses travels on, a spire, a mountain peak and tall grasses are strategically placed to make the answer unclear. Will we ever know? Wait! What about that lizard? 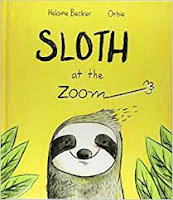 I love the straightforward narration, the humorous, appealing pen and ink and watercolor artwork and the interactive nature of the text. It most certainly is a horse. However, there is enough guesswork to make little ones question what they are really seeing. 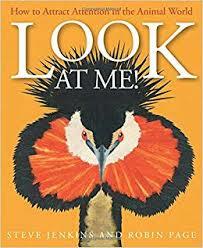 Subtle, and a trifle unsettling, this is a perfect choice for reading aloud with early years students. Little ones appreciate guessing games; this book will be no exception! You could call this a counting book, and you would be right! You call also call it a concept book, and you would be right about that as well. If you missed seeing it as a stunning book of art which shows the natural beauty of a pond environment, you would be indifferent to its meditative and peaceful realism. 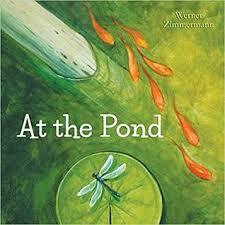 I did read it, and know it was written for Mr. Zimmermann's granddaughter who loves his backyard pond. I appreciate that it will appeal to little ones for the counting experiences it encourages, and the concentration required to look so closely at such a tranquil spot. But, there is so much more! For me, it was only through repeated visits that I noticed more than what was evident initially. It gives such a feeling of quiet wonder as the double page spreads are turned to capture attention and provide a clear look at pond life throughout the day. The water lilies and small log encourage visitors. In the early dawn, the frogs and a salamander make themselves at home there. Soon, sunlight peeks through, as does a single goldfish. Carefully watch the budding lily as it also reacts to the sun. Then, the movement begins in earnest ... one fish after another, more frogs, then insects make their presence known. The lily expands, the sunlight moves across the water's surface and a dragonfly lands. The sudden appearance of a heron sends easy prey to cover. Nothing for the heron here today. The intruder gone, the pond and its wondrous creatures can return to the tranquility once more. And, the counting continues! Full of life and light, this is a book to be admired. The final page includes short, informative paragraphs for the water lily and the pond's many featured guests. Gorgeous! 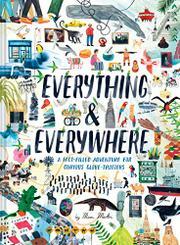 Worthy of its place on the shortlist for the Governor General's Literary Award List for Young People' Literature - Illustrated Books. Mia is welcomed into her new family with a room of her own, and allowed to give it a personal touch by adding things 'big', 'bright' and 'fun'. Perfect and hers alone ... until Brandon arrives. A baby brother adds some constraints, there is no doubt. The room seems smaller, and often dimmer. Moving is a grand idea; there are difficulties. Where will she find space for herself? Each new spot chosen seems right at the onset. Each presents a problem. When the final choice seems exactly right, she is content ... not for long! Something's missing. Readers are sure to enjoy the warm, charming watercolor illustrations that depict the changing family, and its growth from two to four people. They will appreciate the many humorous details, and are sure to recognize on the book's pages much that is familiar to them. Ah, siblings! Anyone would tell you that life with them can be exhausting. On the other hand, what would we do without them? 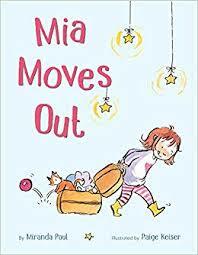 Choosing to 'move out' is a ritual of childhood and growth, isn't it? Mia and Brandon make the best of their choice. for a Magic Hour parade. 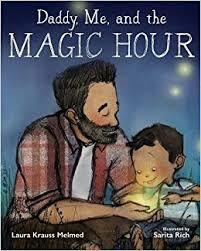 What a truly engaging tale of a daily ritual between father and son! Supper time is not always easy. It comes at the end of long days for little children and for their parents, and is often frenzied. Energy abounds, noise is at its peak, demands are constant, and still a meal must be prepared. Dad begins cooking while Mom feeds the baby; their young son catapults broccoli and then tries to feed it to the poor cat. Finally, it is time to sit and settle. Supper consumed, father and son are off on their 'after-supper walk'. It is a time of visiting neighbors, splashing in puddles, enjoying the many dog walkers, and drawing with sticks. A red bucket provides a receptacle for the many treasures offered and collected. As the two watch twilight slowly descend around them, they find joy in each other's company. It is easy to tell they have been this way before as they share adventure in the park, and making new friends. "The sky is purpling now. glow all silvery as daytime fades away." A shoulder ride for the final few steps, and they are home. Time for a quick and quiet recount of the night's adventure with Mommy before it's lights out and a good night's rest. Sarita Rich ably matches the story's tone in panelled snapshots that provide a detailed look at the many moments shared. There is much to see as they make their way through the neighborhood encountering both familiar and the new experiences. It is a pleasure to be along for the journey. "The breath of the horses rose like smoke in the cold air. And the winter wind told them it was time to move into the big warm barn. In the big warm barn all the animals were waking up, slowly and hungrily, except for the little mice in the hayloft, who had been up all night and were just going to bed. High up in the rafters of the barn, the swallows began to chirp in their deep, warm nests of mud." And see all the cattle." What a lovely invitation! I am going to take this with me when I go to visit my granddaughters next week. They are currently enthralled with a new farm set and spend endless hours caring for the animals and their housing. I know they enjoy this book as much as I do. 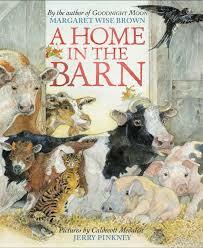 Winter is just around the corner, and it's time for all animals to seek the warmth and safety of the big red barn. Each turn of the page provides new text that evokes the sights, sounds and the urgency for finding shelter. Jerry Pinkney focuses attention fully on the animals and their comfort as they settle into nests in the rafters, soft bundles of straw, cozily-lined pens, and the warmth of a birthing bed for a newly-arrived calf. The farmer and his son are there when needed. As the wind howls and the plethora of animals hunkers down, the warmth spreads and peace falls over their shelter. The radiant warmth of the pencil, watercolor, gouache and pastel images creates a comfortable, peaceful setting. Young readers will appreciate extra time while reading to note the many captivating details included to hold their attention. he makes one false move, you'll zap him with your laser-beam eyes!" The bulldog looked so alarmed that Buddy quickly said, "Do not worry. I will not zap you with my laser-beam eyes. I do not even know how to turn them on. "Thank goodness," said the bulldog. "My name is Mister. I'm sorry if I scared your little friend." Earl is quick to report that he was not at all scared, despite the shrieked AHHH! I am so happy to see these adventure-seeking friends again. You may or may not have met them yet. If not, you are missing out on some hijinks, a lot of inspired dialogue, and a continuing series that is sure to become a class and family favorite. Buddy is a dog, Earl a hedgehog. They are faithful companions in their household, and put up with each other through thick and thin. Their conversations and misunderstandings evoke giggles at every turn, and in each of their, now five, adventures. This time Earl decides they are superheroes, Wonder Buddy and Super Earl. Their mission, should they choose to accept it, is to recapture The Evil Doctor Stinker. Using the Earl-mobile, they discover a hole in the fence that leads to the neighbor's yard, said to be the secret lair of the escapee. And that is how they meet those neighbors ... a cat named Snowflake, who quickly insults Earl by calling him a mouse and Mister, a bulldog. The adventure? Well, it turns out that Snowflake is a bit of a braggart. She quickly becomes the victim of her own bravado, and needs rescuing. It's Super Earl to the rescue! Then he flapped his arms as hard as he could. supervillain! We're going to have to try Plan B!" What is Plan B? Can Earl save Snowflake from certain disaster? If this is your first book, be sure to look for the others in the series. 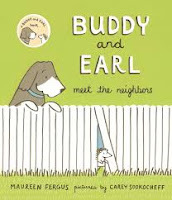 Buddy and Earl (2015), Buddy and Earl Go Exploring (2016), Buddy and Earl and the Great Big Baby (2016) and Buddy and Earl Go To School (2017). Steve Jenkins and his wife Robin Page continue to amaze with the research they do; the careful, clear facts they present on all manner of animals in our world. 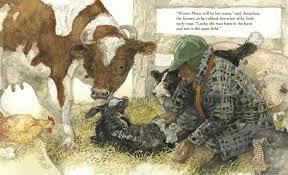 In this book they tell readers about animals that want to be seen. Then, we are off to discover the many animals who love to make themselves known by whatever method is inherent to their own species. 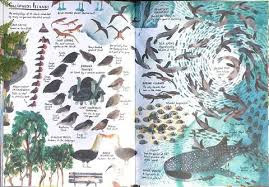 Each turn of the page introduces two or more animals that have one particular thing in common. The hooded seal and the magnificent frigatebird have a big red balloon, used to attract a mate. The Mediterranean mantis and the male blue-spotted mudskipper dance to threaten predators, or to impress a female. Thirty-nine different creatures are featured in this fine book that show young readers the many ways they get the attention they seek. The descriptive paragraphs offer just the right amount of text to provide for new learning. Steve Jenkins’ easily identifiable illustrations are colorful collages placed on white backgrounds, allowing the animal itself to be the focus of attention for those reading this book. Whether it's the brilliant plumage of the great crested grebe and the royal flycatcher, or the brilliant colors of the many poisonous frogs and slugs that grace one double page, there is much here to attract and hold attention as the book is shared. As they do in most of their books, the authors add final pages that offer a repeated thumbnail image of each included creature, accompanied by additional relevant data. Always beautiful, and very much admired work. Where are the ants going? Where the road leads them. Lulu asks a lot of questions." Mrs. Badger loves to hike. She makes her way to Sugarloaf Peak every single Sunday. She is happy to see other creatures along the way, and often stops for a quick chat. It is her habit. Then, one Sunday, she feels the presence of someone else. She invites the small cat to share her food and her resting place. 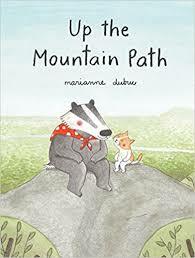 The cat is fearful and too frightened to attempt climbing the mountain that Mrs. Badger climbs so successfully each week. For Mrs. Badger, nothing is impossible. mountain for the first time." But sometimes it's hard to have faith." Off she goes, leaving her young acquaintance sitting on her own. The cat really seems to want to join her, and does. Mrs. Badger enjoys the company, and shares her knowledge with her young companion, Lulu. Their trip is informative, and tiring. But, they make it to the top. It becomes their Sunday ritual. Lulu grows more confident and knowledgeable through Mrs. Badger's patient tutelage. Soon, Lulu is the one lending support. Finally, Lulu walks the path alone. She returns each time to share stories with her mentor, and enjoys those solitary journeys ... until the day she meets a young rabbit. "I have a wonderful place to show you." Using pencil, colored pencil, and watercolor washes, Ms. Dubuc provides a winning natural environment for her characters and their adventures on the mountain. This is a warm and loving account of friendship, love of nature and patient guidance. "I told my mom about Adrian's horse and how he definitely does not have one. "Hmm," she said. "And how would you know, Ms. Smarty-Pants?" "Because I know! 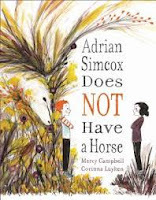 Adrian Simcox does NOT have a horse!" Adrian Simcox gets free lunch at school. His shoes have holes. Kelsey told me her cousin has a horse, and it's super expensive. He can't take care of a horse." Adrian loves to talk about his horse when he is at school. Chloe will have none of it. She knows he's lying. She knows he lives in town, and has no room to take care of a horse. She wants everyone to know that she knows Adrian is lying. She will go to any length to prove she is right. She is aware that she makes Adrian sad when she announces to everyone that he is not telling the truth about having a horse. Then she and her mother visit with Adrian and his grandfather. Her mother knows his grandfather and suggests it. Their house is very tiny, and there is definitely not room for a horse in the back yard. Chloe wants to repeat her accusation, but seeing Adrian's face gives her pause. reminded me of when I told those little kids he was lying." It is a turning point, and the beginning of a new friendship ... a friendship that leads to much admiration for a boy with a stellar imagination. I love this quiet story. It is told with feeling and lovely language, allowing readers to feel empathy for Adrian and to see how Chloe recognizes what is special about him. In learning to be kind, rather than correct, she is able to open up to the possibility of this new friendship with a pretty special boy. Corinna Luyken uses ink and watercolors to create outstanding artwork, full of expression and imagination. There is a lot of contrast in the images she creates to show the differences that exist between Chloe and Adrian. The final double page spread is full of the magic that fills Adrian's head. flowers so the tiny bird ... "
Little ones are going to enjoy the question and answer format that this book offers. It begins with the great horned owl, recognizable to many. The question is about the shape of its head - with tufted 'horns'. A descriptive paragraph follows at the turn of the page. It offers enough information about the head to keep its audience interested, without overdoing it. 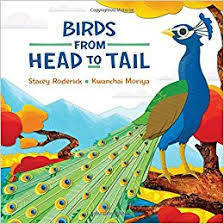 The author continues that format, asking questions about the beak, eyes, body, wings, legs, feet, and finally the tail ... thus 'birds from head to tail.' Most birds presented will be familiar. Each body part and its function for the bird is described in accompanying text.
" A flamingo's stilt-like legs are perfect for wading. deeper water to find more of the food it eats." "The artwork in this book was created in Adobe Photoshop and Illustrator, using original photographs and textures." The illustrations are filled with bright colors. The textures and collage-like images give a real sense of the environment and offer depth and detail. Following the main body of text, the author adds another group of familiar birds, accompanied by a detailed thumbnail illustration of the bird itself, and a short statement. 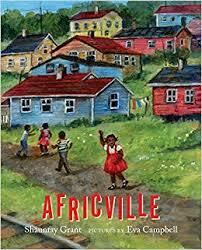 The first time I heard mention of Africville happened when I was visiting my son while he was living in Halifax. I was, and am, sad to say I knew little about it. This lovely new picture book helps to rectify that. A young child arrives at 'the end of the ocean' in a place that gives a historical perspective for the Africville community. Her observations offer a tribute to its beauty and its place in history. Some of what she sees evokes shared events with all children; others are specific to the site itself. She watches as children play football, go rafting, catch fish, and enjoy a bonfire. The text is meaningful and economical, while full of emotion. The exceptional artwork brings Africville to life using oils and pastels on canvas. Endmatter describes Africville, a black community that dated back to the late 1700s. It was a 'vibrant, self-sustaining community that thrived in the face of opposition.' Its history is shared, and readers are given further information and resources for where to find out more. 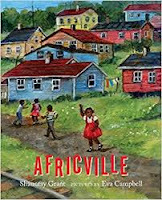 Of this book Ms. Grant says: "My hope for readers is that whoever picks up the book will feel something, they’ll learn something about Africville, but they’ll also get that universal feeling of home from the text which I think we can all relate to no matter where we come from." "It is thought that Tutankhamun did not take part in any military campaigns himself, possibly because of his poor health. Despite that, no one was prepared for the sudden shock of his death. Records suggest that he was just 18 or 19 years old when he died, and to this day, no one knows for certain what caused his death. 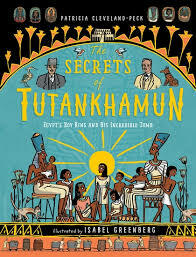 The mystery of Tutankhamun's short life would continue to be studied ... "
You surely know the students who want to read this book. Much has been written about King Tut, the discovery of his tomb, and the fact that he was a 'boy king' when he died. This book provides details about the Egyptian family, officials, and nurses who were part of Tut's story, and also the archaeologists and explorers who played a role in discoveries made of his tomb and the forensic evidence that has helped to piece together a part of his tragic story. In Part one, the story begins with family, what is known about them and their rule, Tut's early carefree life is shared. But, things do not remain so for him. He is too soon the only remaining member of the royal family, and becomes king at 9. Decisions in his name are made and a marriage arranged. There is no clear evidence to show how he died, or why. Readers will learn the detailed process for mummification and why it was done. was not ready. The paintings on the wall were still wet when his tomb was sealed." Part two describes those who search the tombs of Egypt, the knowledge and skill they gain in a bid to discover Tut's tomb, the discovery in 1922, and all that is there to be found when it was opened. It is a fascinating find, and each successive chamber adds a new level of understanding to a story that is told in a clear, accessible style. The third and final part discusses how forensic science has allowed a deeper understanding of what likely happened. There is no definitive evidence leading to a determination for the cause of death. The illustrations are helpful and often captioned to describe the people and the events of the story. It has the feeling of a graphic novel, and that will certainly appeal to its target audience. There are maps, quotes and letters included to help provide context. Kids interested in history, and especially Egyptology, will find much here to like. It may even lead them to follow up with some research of their own. This is fascinating stuff. "Mustafa looks down at the park. with dust and dry as sticks. He sees birds hiding in the trees. Red birds, blue birds, yellow birds. the air. They chatter like monkeys. "Do you want to play in the park?" What a tender read this is! Mustafa and his family have moved from their home country due to the war raging there. This new home is peaceful, and a far cry from what they left behind them. As he familiarizes himself with his surroundings, he is an observer. There is much to see, and he wants to take it all in. When his mother suggests a trip to the park they can see from their window, he is off. 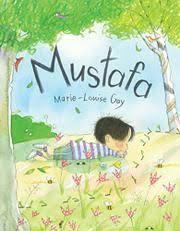 "Mustafa walks under the trees. That air smells green and cool. He sees flowers shaped like his grandmother's pink teacups. He sees flowers that look like dragon tongues. He finds two treasures - a white snail shell and a yellow heart-shaped leaf." He also sees a young girl, and her cat. The girl speaks to him. Mustafa does not understand what she is saying and quickly runs home. He tells his mother about the park; he does not tell her about the girl. On his next visit, he spends time drawing scenes from his past, and finding new treasures. The girl sees what he is doing, does her own drawings, and speaks to him again. Off he runs. Every visit to the park brings new experiences, and ups his level of comfort with all that happens there. However, no one seems to notice him, and he worries that he is invisible. His fears disappear when he next meets the girl, who encourages him through gestures to follow her. No words are needed. And, then they are. The most important words to begin a friendship. Maria and Mustafa! Absolutely glorious! I will read it often. And I haven't even mentioned Marie-Louise Gay's warm and always brilliant watercolor artwork. "But nearly 80 percent of the food products and 93 percent of the beverages athletes endorse aren't good for you - or for pro athletes! NBA All-Star Stephen Curry bucked the trend recently when he agreed to promote Brita water filters, encouraging everyone to drink more H2O." 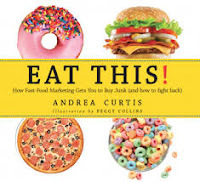 This is a brilliant book meant to inform kids about the ways marketers work to get their attention and convince them to consume the products they are promoting. "But much of the marketing is for things that aren't healthy. Foods like French fries, chips, chocolate bars, cookies, and hamburgers, beverages like soda and sports drinks. What's more, marketing works." In 15 short, two page chapters, the author explains what marketing is, where products are placed, how kids spread the word about the products they are trying ... the list goes on. It is always thoughtfully presented and offers readers the opportunity to think about how they are affected by what they see and hear. Ads appear in almost every facet of their lives ... movies, television, video games, magazines. They encourage kids to spread the word and convince others that the products are worth a try. She presents her information in a friendly, non-threatening way, simply giving them the goods on how marketing works. The author includes ideas for combating the constant barrage of influences kids are seeing in a 'DO THIS! chapter, which offers plans for making changes to what is being shown while children are watching their favorite shows on television, and asking companies to cut back on the mascots used to advertise their products. As parents and caregivers become more aware of what their children are seeing and speaking about those concerns, companies are encouraged to make changes if they want to remain viable in the marketplace.
" ... some places, such as Chile and the city of San Francisco, California, have decided it's not fair to encourage young children to eat junk food by offering them toys. They've created legislation banning restaurants from offering free stuff when you buy a meal." McDonald's Canada is now giving kids the choice from two Canadian children's books as a reward in their Happy Meals. How cool is that? Two final chapters, one aimed at students, parents, and teachers and another DO THIS! that makes suggestions for what we can do to combat the effect marketing has on the choices we make. Knowing more means we can do better. I've tried hiding it away. I feel bad about my neck, too. I'm with Nora Ephron on that. It is such an age-defining thing for human beings. But, meh! It is what it is, and I have no control over it. Edward shares my concern. He feels his is too 'necky'. Who can argue with that? 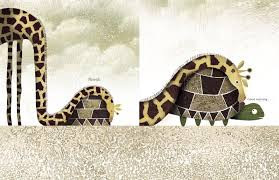 Have you seen a giraffe's neck? It is his defining feature, isn't it? Edward's neck certainly causes others to stare, and Edward is embarrassed by the attention. He compares himself to others, and is envious of those necks that work! 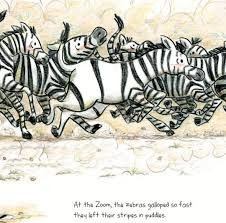 Take the zebra ... stripes look great. Or the elephant ... what's not to like about the strength and grace of that neck? There are many necks he would rather have than his own. His mother assures him that others are jealous of his neck. He is unconvinced. It isn't until Edward meets a turtle that he realizes his mother has been telling him the truth. Poor Cyrus! He feels bad about his neck, too. After watching a banana ripen for seven days, Cyrus is desperate for that banana to fall to the ground, providing sweet nourishment. Edward is a willing assistant in the quest. Cyrus is ever thankful, and shows it. "Edward, face it - your neck is impressive. It allows you to do amazing things. banana dilemma in ten seconds." Wouldn't your kids at home, or your early years students love to pair read this book? The humorous, yet meaningful text will have everyone giggling. This companion book to Penguin Problems (2016) is as funny as the first one. Lane Smith uses an earthy palette of green, gold and brown with textured details to engage readers and show all of the emotions felt by both Edward and Cyrus. "Well, my heart soared up high in my chest at those words. I saw the vending machine as if it were right in front of me. It glowed with all of its special objects - ballpoint pens, cheese-filled crackers, candy bars, rain bonnets - each one of them giving off its own special light. "My goodness," I said to him. "Anything you want." He smiled. He looked like a pirate, standing up there with the crow on his shoulder." Oh, Kate DiCamillo! What a writer you are ... I am forever indebted to you for the joy you bring to my reading life. When I met the cast of characters in Raymie Nightingale, I hoped that there would come a time when I might meet up with them again. I did not know that Louisiana had her own story to tell. Louisiana's first person narration is strong, observant, full of power and angst. She is a wonder, and I am thrilled to know more about her. There are many readers out there who will be as happy as I am to share her story. I found myself stopping to reread passages, and know that I will read it again after my friend Don has had a chance to read it as well. She begins at the beginning with her great-grandfather and a curse. That 'sundering' curse causes her Granny to set out in the middle of the night, her granddaughter in tow. She will not say where they are going; she does say that they are going because the 'day of reckoning has arrived.' That is all that Louisiana knows and it is not very satisfying. As they cross the state line from Florida into Georgia, Louisiana becomes more desperate about their home, her friends and all they have left behind. On the way her grandmother becomes ill with a paralyzing toothache and they must find a dentist to help. They pull into the small town of Richford, Georgia, where they find a dentist. He decides he must remove all of her teeth. It puts a stop to their journey. They find a motel, and prepare to stay until Granny has improved. Louisiana's life until now has never been easy; it gets a whole lot worse when her granny abandons her at that motel. What will the young girl do? The chance that her story could become even darker and more devastating at this point is a possibility. Luckily, Louisiana does not give up. Her determination to be who she wants to be, after learning the truth about her birth in a letter left by Granny, and the goodness in the hearts of some of the community members she meets, help Louisiana stay and find the true meaning of home. "This side of the book is safe. The other side is not. Jon Agee is a fine writer, and one who shares irony in many of the books he writes. The gutter of this thoughtful and wise book is a tall brick wall. It separates what is taking place on either side of it. The knight is carrying a ladder and full of assurance that it is the other side that is dangerous. The hippo, tiger and gorilla on the recto seem interested in seeing what is on the other side. The knight is pleased to have the wall for protection from that other side. The knight remains cheerful and optimistic; readers will know he should be worried. When a tiny mouse sends the seemingly dangerous animals scurrying for their lives, the knight's side of the wall shows rising waters. Despite the change in circumstance, the knight fears only the ogre on the other side. The knight sees no reason for concern on his side. He has been taught to fear what he cannot see on the other side, especially that fearsome ogre. In the meantime, the ogre is listening to what is happening on the knight's side and provides a helping hand in the nick of time. OOPS! Now, the knight is on the dangerous side of the wall? Or is he? Perfect pacing, exceptional storytelling ... exactly what I have come to expect from this talented and accomplished man. What is revealed in his illustrations is not always true to the text. That is where the fun lies. 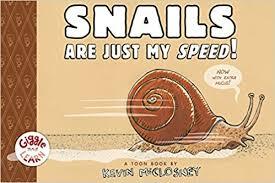 "Snails make a lot of mucus. This is one of the books that Sicily and I read daily while she was here in May. She loved it, and had a lot to learn about snails. It is the fourth title in a wonderful set written by Kevin McCloskey, called the Giggle and Learn series. Others include the early reader comics, We Dig Worms (2015), The Real Poop on Pigeons (2016), and Something's Fishy (2017). 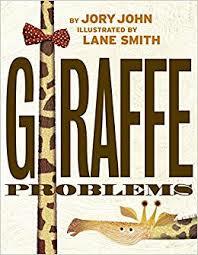 Informative and funny, they deserve a place in nonfiction bins and on library shelves. Despite the mucus trails, snails are endlessly fascinating for so many other reasons. They move so slowly that even an earthworm is '50 times faster than a SNAIL.' They can hide from those animals who wouldn't mind having them for dinner by camouflaging themselves in rock piles. They do have enemies - salamanders, hedgehogs, toads, frogs and blue herons. They can be a menace in gardens and they are messy! Some people even eat them. So much to learn, and is such an inviting format. The cartoon illustrations will be much appreciated, while also offering useful facts. Variety in species is shared, as is a step-by-step guide for drawing them. Your students will love them! ABSOLUTELY I CAN COACH YOU! "How should we do this?" JUST DO IT! I WILL ASSIST. The cat saw the birth of the ink splotch that becomes Inkling. He watched as the ink on the page that Ethan's father had been drawing pulled itself up and move off. It found its way to Ethan's bedroom where it began consuming the ink from his textbooks. Discovered by Ethan the following morning, and named Inkling, it becomes a driving force in changes for the entire Rylance family. And it becomes a 'he' ... a fully realized character. 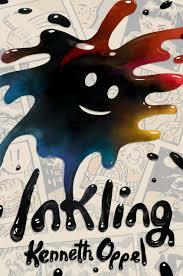 It takes no time to believe in Inkling as an entity, capable of kindness, understanding and thought. Mr. Rylance has a problem. Since the death of his wife two years ago, he has been in a writing (and living) slump. The responsibilities he feels for his family and their well-being are overwhelming for him and he spends many days ineffectually. Ethan has a problem. His writing group at school believes that, since his father is a famous graphic artist, he must have inherited his artistic ability. His task is to draw the art for their project. He doesn't know how to tell them he cannot do it. Ethan's sister Sarah, who has Down's Syndrome, has a problem. She wants a pet in the worst way and is making no headway with her father toward getting one. It is a house in turmoil. Along comes Inkling, with a kind heart and a thoughtful disposition, and a unique ability to help. He knows how to read and can communicate by using the ink he consumes to form words on paper. The fact that he takes on the writing style of the books he reads offers some very funny moments. His ability to help each family member find their way is heartwarming. When he is kidnapped by one of Ethan's classmates, the family is forced to deal with the trauma of the loss of their wife and mother. By the time Inkling returns to his beginnings, each member of the family has changed. It is quite the tale of love, loss, and healing. 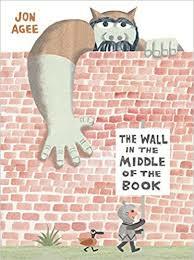 This is another terrific readaloud for a middle years classroom. Beautifully written and absolutely memorable. a milkweed seedpod. When the seeds are full-grown, the pod bursts open. Then the wind whisks the seeds away. How do milkweed pods fly through the air? Each seed has dozens of light, silky hairs." What an invitation this beautiful cover provides! As the reader moves into the text, a list of words to know is presented: berry, burr, fruit, nut, seed, and seedpod. They will definitely help the target audience better understand the text to come. Melissa Stewart begins by explaining in clear text, and with effective photography, what happens when a corn seed is planted. She goes on to explain where plants flourish and how the way they move assures new growth. 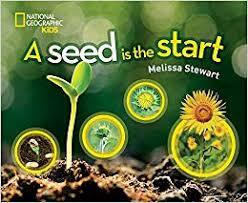 She tells her readers that seeds have many ways of traveling - they fly, spin, glide, tumble, spill, splash, float, drift, pop, hop, creep, hook, cling, and ride inside and outside. The result of all that movement often provides a good spot for a seed to land. When it sprouts it becomes the plant it was meant to be! Where are they headed? Back to their nest. surrounded by rich soil full of rotting material. What a perfect place to grow!" The photos are exceptional, the design perfect for young readers, and the information provided is thorough and educational, while also engaging. It is sure to be a hit!